The best results in GERD treatment can be achieved if the strategic treatment is targeted at the roots of GERD as well as the symptoms. The homeopathic treatment addresses precisely the same. Homeopathic has been found to be extremely effective for GERD. 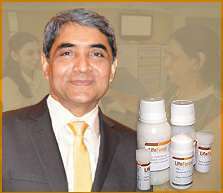 Dr Rajesh Shah's treatment for GERD entails his Patented product along with traditional homeopathic medicines, which give best possible results in GERD. Dr Shah has patients from over 127 countries under his care for furious chronic diseases. Most patients observe notable improvement in about six weeks. Patients require being treated for about eight to ten months. Results vary from patient to patient. The medicines are absolutely safe and free from any side effects.